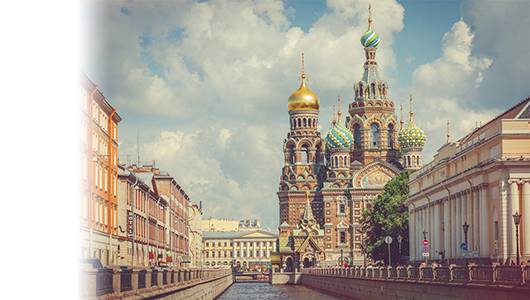 Find out more about how our travel insurance can cover your holiday to Russia. When you’re ready, get a quote online or talk to our friendly team today. Do I need travel insurance for Russia? When you’re planning a holiday to Russia, it’s really important that you get covered by the right travel insurance. Having a suitable insurance policy helps to cover you should something unexpected happen. It includes things like having to claim for lost possessions or needing help in a medical emergency. There’s no medical agreement in place between the UK and Russia so their medical facilities won’t accept the European Health Insurance Card. This means that if you have a medical emergency, you will be expected to pay for any services you might need. If your bill comes to more than £350, we’ll try and pay any agreed fees directly to the medical facility. We’ll help make sure you’re getting the care you need and organise emergency transportation if you could get well quicker elsewhere. Even if that’s in a different country. We can help you to find a trustworthy medical facility if you’re feeling unsure of where to go. On top of all of that, we can also help to translate between you and your medical team so that everybody is speaking the same language. Available 24 hours a day, 7 days a week from around the world. When you need us, we’ll be right here. It makes a really bad situation a little better knowing that you’re covered by the UK’s Most Trusted Travel Insurance Provider*. We specialise in helping people with pre-existing conditions to be covered properly with the right travel insurance. It’s essential that you cover all of your pre-existing conditions. Not covering your conditions will mean your policy won’t protect you properly and any claims will be declined. Telling us about your conditions is hassle free. We never rush and we treat any information you tell us with dignity and respect. There’s no invasive medical exam – just a simple questionnaire that you can fill out online or over the phone on 0800 033 4902. If after buying a policy you’re diagnosed with a new condition, or something changes, then it’s crucial that you tell us about it. We’ll update your policy where we can. With us, you can upgrade at anytime as long as you haven’t travelled, made a claim on your policy or would be looking to make an immediate claim on an add-on. You won’t need to cancel your original policy and rebook. Call our Customer Services team and we’ll help to get you covered. Although we can upgrade your policy, we won’t be able to reduce it without cancelling your policy within our 14 day cooling off period. So, it’s worth making sure that you’ve booked the right policy for your needs. If it’s worth doing, it’s worth doing right.